Do your shopping at Marrakech Souk and Herboriste du Paradis. Do some cultural sightseeing at Menara Gardens and Pavilion and Ben Youssef Madrasa. There's lots more to do: hunt for treasures at Jemaa el-Fnaa, admire the landmark architecture of Bahia Palace, stroll the grounds of Saadian Tombs, and steep yourself in history at Koutoubia Mosque and Minaret. To find maps, photos, where to stay, and more tourist information, refer to the Marrakech trip itinerary planner . Alexandria, Egypt to Marrakech is an approximately 11.5-hour combination of taxi and flight. You can also do a combination of bus and flight; or do a combination of taxi, flight, and train. You'll gain 2 hours traveling from Alexandria to Marrakech due to the time zone difference. Traveling from Alexandria in November, expect slightly colder with lows of 12°C in Marrakech. Finish up your sightseeing early on the 26th (Mon) so you can go by car to Essaouira. On the 27th (Tue), don't miss a visit to Galerie d'Art Damgaard, look for gifts at Cooperative Tamounte, then wander the streets of Medina of Essaouira, and finally stroll through Essaouira Beach. For ratings, photos, more things to do, and more tourist information, use the Essaouira day trip site . Traveling by car from Marrakech to Essaouira takes 2.5 hours. Alternatively, you can take a bus. In November, plan for daily highs up to 24°C, and evening lows to 15°C. Finish your sightseeing early on the 27th (Tue) so you can drive to Agadir. Start off your visit on the 28th (Wed): tour the pleasant surroundings at Taghazout Beach, then take in panoramic vistas at La Grande Roue Agadir, and then kick back and relax at Plage d'Agadir. 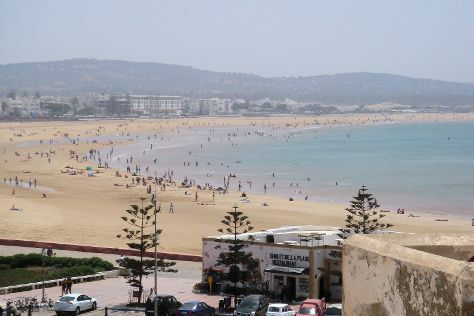 To find where to stay, maps, and other tourist information, go to the Agadir holiday planning website . Traveling by car from Essaouira to Agadir takes 3 hours. Finish your sightseeing early on the 28th (Wed) so you can travel to Casablanca. To see reviews, more things to do, other places to visit, and tourist information, go to the Casablanca trip planner . Traveling by combination of flight and train from Agadir to Casablanca takes 3 hours. Alternatively, you can drive; or take a bus. November in Casablanca sees daily highs of 25°C and lows of 15°C at night. You will have some time to spend on the 29th (Thu) before leaving for home.